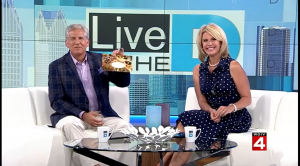 Live in the D (August 2014) – Our Town America metro-Detroit franchise owner, Larry Neal, on WDIV-TV's 'Live in the D' spotlight with Vikki Brown of sponsor business Edible Arrangements and Detroit new mover Mika Dajos. The Our Town America new mover welcome program specializes in helping families that are new to a community connect with reputable local businesses who are searching for new, loyal customers. Interested in welcoming new families to their new area? Contact us to be a sponsor business or open a franchise in your local community!